Mahindra Auto New Zealand | Is Indian-based Mahindra the next car-maker set to make it big? Is Indian-based Mahindra the next car-maker set to make it big? 09 Apr Is Indian-based Mahindra the next car-maker set to make it big? Too often motoring scribblers cover the industry as if it’s sport; a tale of winners and losers, rivalries and grudge matches. It’s an unfortunate trend that has circled back to numerous manufacturers, many of whom proudly gloat at press events about who they’re beating, and by how much. Whether the cars are any good often feels secondary. These were the words of Joydeep Moitra; head of international operations at Indian car-maker Mahindra. He spoke at the manufacturer’s recent media event in Taupō — a relaunch of sorts for a carmaker that had “become invisible” in New Zealand. But, that might not be the case for long. If you currently think Mahindra are some small, left of centre blip on the motoring radar, you may want to reconsider. What began in 1945 with two brothers — JC and KC Mahindra — building licensed Jeeps has blossomed into a USD$20b business with seven straight years of growth. They have over 240,000 employees working in over 100 countries, spread across 11 different sectors. Cars, including sister company SsangYong, represent just a slice of the complex Mahindra pie. It’s the largest tractor manufacturer in the world according to volume, in part through their ownership of Mitsubishi’s tractor sub-brand. It represents India’s largest pre-owned car dealer and financier network. And it also dabbles in aerospace, real estate, hospitality, and more. In a way, Mahindra has a similar look and feel to the emerging car-makers of China — highly successful in its own market, with the desire to penetrate the Western world. But, unlike those in China, Mahindra aren’t currently being crimped by potentially messy tariff and trade discussions with the US. 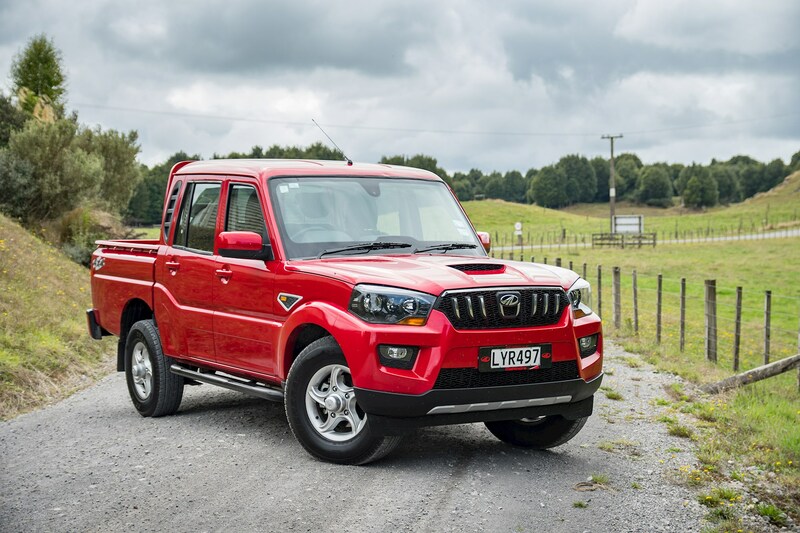 It’s one of many reasons that Mahindra feel that the time is now right to make a big global push in places like New Zealand; the aim being to sell over 1000 vehicles here annually by 2022. 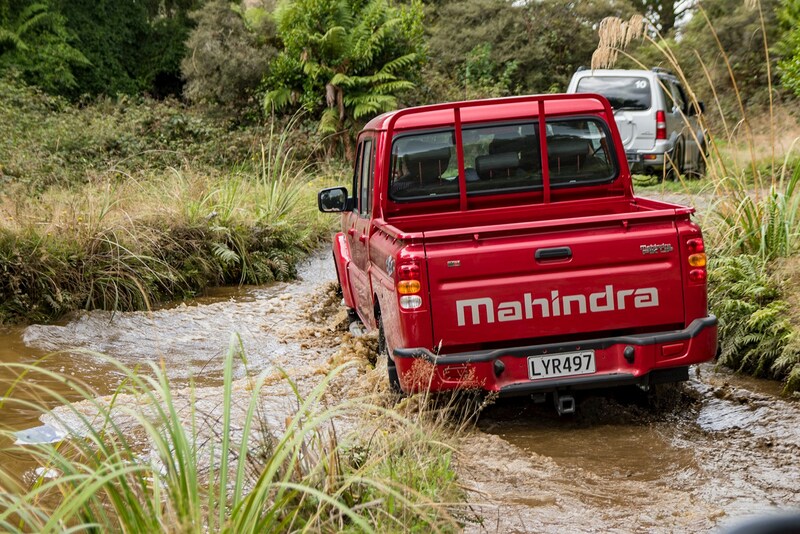 Just two vehicles make up Mahindra’s current Kiwi line-up. Most obvious is the Pik Up — a ute available as either a single-cab or double-cab. 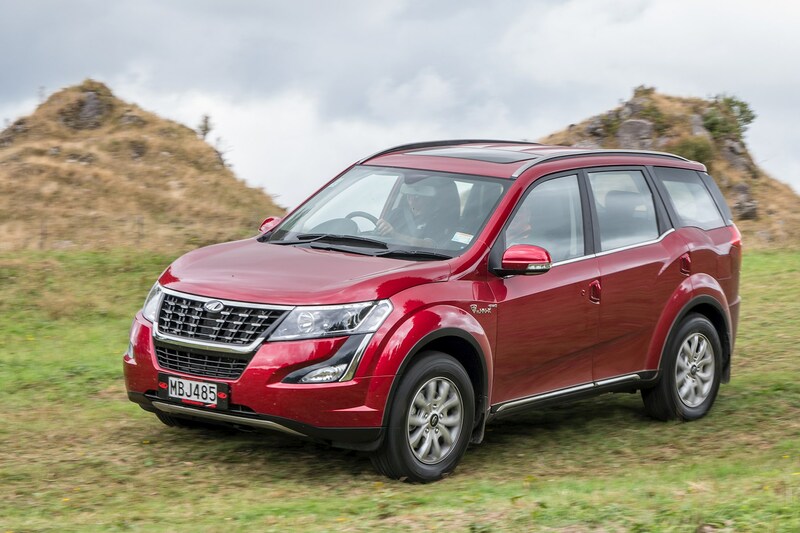 More oblivious is the XUV500, a comparatively quiet value-focused seven-seat SUV. While the instinct from knockers might be to place both in the same ‘too exotic, too weird’ basket, they’re actually quite different. The Pik Up is proudly old-school, wearing the brand’s proud gravel-bashing history on its sleeve. The XUV on the other hand is clearly designed from the ground up to have mainstream appeal, and could easily be mistaken for some of its school-running, load-lugging rivals. 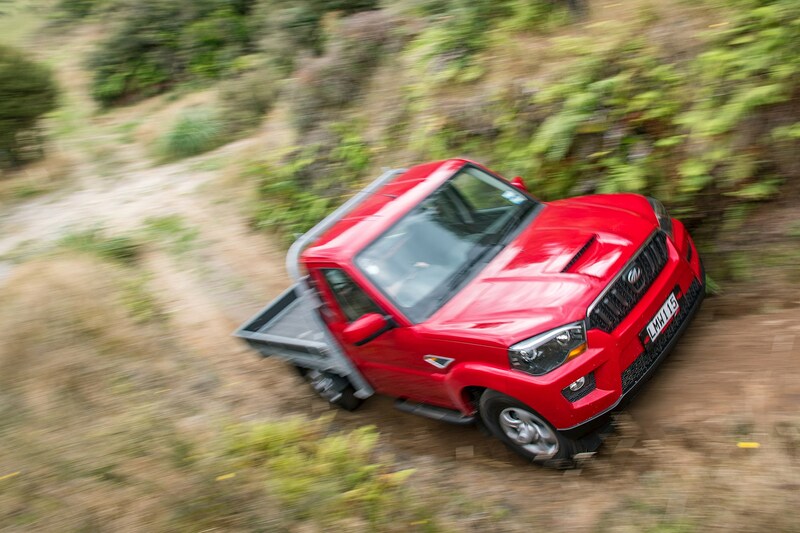 The cheapest way to get into a Mahindra is via the single-cab Pik Up S6, which starts at $25,990. The entry-level double-cab is $29,990, and the top-spec S10 (featuring a touch-screen infotainment system, dual-zone climate and more) is $33,990. The XUV’s pricing is similarly sharp, with the two-wheel drive foundation W6 starting at $29,990, with the higher spec W10 priced at $35,990 for the FWD and $39,990 for the all-wheel drive. The majority of our time behind the wheel was spent tackling Off Road NZ’s complex Taupō course in each of the three Pik Up trim levels. Though there are cosmetic and tech-toy differences, each shares the same powertrain and transmission — a 2.2-litre turbo-diesel four pot making 103kW and 320Nm, paired with an Aisin six-speed manual. Driven’s Paul Owen has already aired a full road test on the Pik Up, appearing to fall mildly in love with the slightly grotesque ute. With an air of hesitation, I did what I could to try and disprove his thoughts. But, that proved hard. The Pik Up is certainly not attractive. But, it’s quite clearly not trying to be. It’s also not trying to be refined or ‘car like’ unlike seemingly everything else in the segment. Instead its single-minded focus is utility. And with this off-road course as a backdrop, it showed just how well it nails the brief. Despite each model only being fitted with 245/75 Grabber road tyres, none of the off-road tasks represented much of a challenge. While some of this can be credited to simple, old-school engineering and extensive testing, it’s also worth noting that the Pik Up comes with the right tools underneath; including but not limited to a BorgWarner low-range transfer case and an Eaton locking differential (the latter being particularly in handy for the articulation test track). One specific hill, incredibly steep with deep tyre-track ruts on each side, looked set to properly challenge the Mahindra’s mettle. 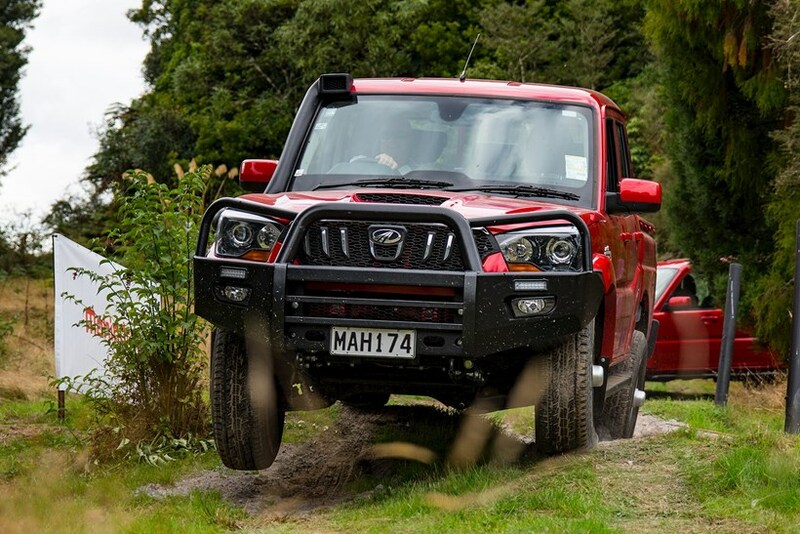 One of Off Road NZ’s staffers could be heard saying that it’s a hill most manufacturers don’t ever attempt to climb. However, in second gear with the tacho’s needle nudging red line, each Pik Up mounted the incline one by one. No sweat. Some will guffaw at the styling or the 3-star ANCAP safety rating, but they’ll be missing out on a surprisingly charming, unsurprisingly capable utility. It is to the double cab what the Suzuki Jimny is to the compact crossover. 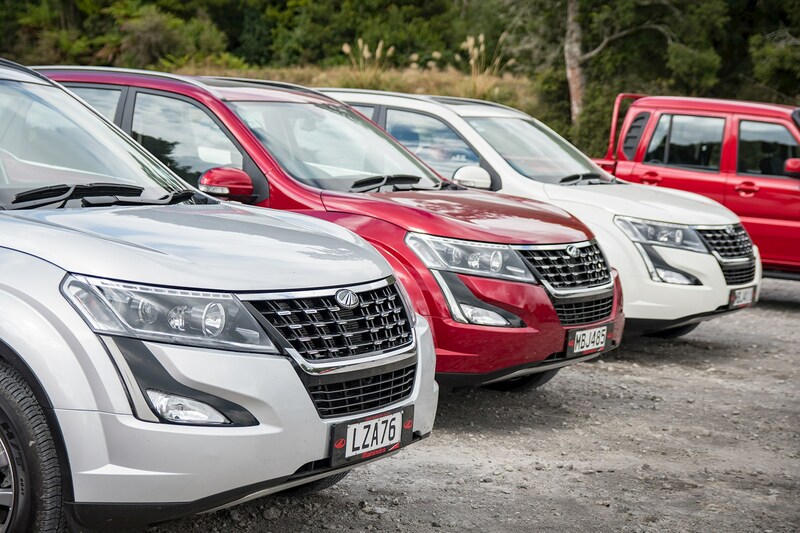 Our traveling from the off-road park to the night’s accommodation and then back to Auckland the following morning was in the XUV500 — an approximate four hours of commuting spent behind the wheel of the entry and top-spec models. Questionable interior materials and that ‘distinctive’ rear wheel-arch design are both certain to raise eyebrows, but there’s no denying newly refreshed model’s space and comfort. Powered by the same mHawk 2.2-litre turbo-diesel as in the Pik Up, the XUV500 sports more torque than most in this bracket. That doesn’t necessarily manifest in quick performance off the line, but it does give it surprisingly confident towing capabilities — a claim that we were able to verify with the aid of a dual-axle trailer. 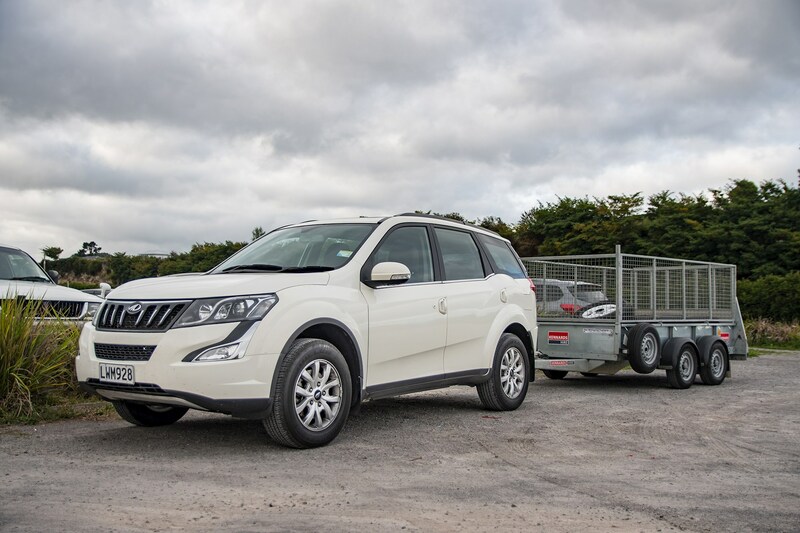 Keep an eye out for a full XUV500 road test in the coming weeks. Overshadowing both the Pik Up and XUV is the issue of age. The former dates back to the mid-00s, while the latter turns seven this year. Mahindra’s short-term solution to the dilemma is to target alternative markets. The Pik Up is already proving successful as a farmer-focused alternative to the world of quad bikes and side-by-sides. It’s hoped that the XUV on the other hand, with its competitive pricing, can steal away those potentially shopping for second-hand vehicles. And long term? Well, while they remained tight lipped about exactly what’s on the menu, electrification is the next logical step. They’ve already unveiled a 1416kW, $3m, fully electric hypercar — the Pininfarina Battista — which is set to hit production next year. That’s nice and all, but what we’re really interested in is what they’ll produce for consumers like you and I. And in that regard, we wait with bated breath.